پژوهش حاضر در پی طرح سنخ‌بندی انتقادی هویت کارآفرینانه است. اتکا بر رهیافت انتقادی به‌ویژه تعریف عقلانیت از منظر یورگن هابرماس و ابعاد مربوط به چارچوب مفهومیِ ناظر بر سنخ‌بندی هویت کارآفرینانه، از یک‌سو به شکل‌گیری قطبیتِ عقلانیت رهایی‌بخش در برابر عقلانیت ابزاری، و از سوی دیگر به قطبیتِ فردمداری در برابر جامعه‌مداری می‌انجامد که در نتیجۀ آن چهار سنخ هویت کارآفرینانه شامل آزادی‌خواهی، استقلال‌‌طلبی، نظم‌طلبی و سودجویی معرفی شده‌اند. در ادامه، جایگاه هر یک از این سنخ‌های هویتی در شناخت اقسام گوناگون کارآفرینی، بررسی و ضمن مقایسۀ این هویت‌ها، چهار نوع کارآفرینی شامل کارآفرینی عمومی، کارآفرینی سبک‌ زندگی، کارآفرینی بوروکراتیک و کارآفرینی تجاری معرفی و دلالت‌های مفهومی این نوع سنخ‌شناسی طرح می‌گردند. پاین پژوهش علاوه‌بر غنای مطالعات هویت کارآفرینانه از طریق به پیش کشیدن نقش عقلانیت و قضاوت دربارهٔ جامعه، به تفاوت و تعارض این هویت‌ها نیز اشاره دارد . اتکا به مواضع نظریهٔ انتقادی در مطالعهٔ هویت کارآفرینانه، گامی است در راستای تعمیق سرشت میان‌رشته‌ایِ پژوهش کارآفرینی. پین، مایکل (1382). فرهنگ اندیشه انتقادی از روشنگری تا پسامدرنیته (مترجم: پیام یزدانجو). تهران: نشر مرکز. شِرَت، ایوان (1393). فلسفه علوم اجتماعی قاره‌ای: هرمنوتیک، تبارشناسی و نظریه انتقادی (مترجم: هادی جلیلی). تهران: نی. 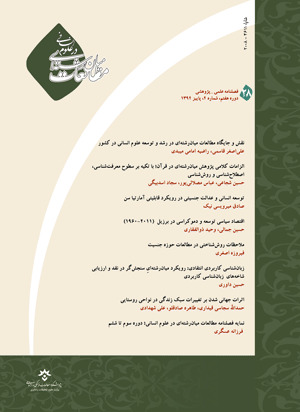 گیدنز، آنتونی (1394). تجدد و تشخص: جامعه و هویت شخصی در عصر جدید (مترجم: ناصر موفقیان). تهران: نشر نی. مکاریک، ایرناریما (1388). دانش‌نامهٔ نظریه‌های ادبی معاصر (مترجم: مهران مهاجر، و محمد نبوی). تهران: نشر آگه. نوذری، حسینعلی (1381). بازخوانی هابرماس. تهران: نشر مرکز. هابرماس، یورگن (1392). دگرگونی ساختاری حوزه عمومی: کاوشی در باب جامعه بورژوایی (مترجم: جمال محمدی). تهران: افکار. هولاب، رابرت (1393). یورگن هابرماس: نقد در حوزه عمومی (مترجم: حسین بشیریه). تهران: نشر نی. وبر، ماکس (1395). اقتصاد و جامعه (مترجم: عباس منوچهری، مهرداد ترابی‌نژاد، و مصطفی عمادزاده). تهران: سمت. Alvesson, M., & Willmott, H. (Eds. ), (1992). Critical management studies. London: Sage. Alvesson, M., & Willmott, H. (Eds. ), (2003). Studying mangement critically. London: Sage. Berglund, K. (2006). Entrepreneurship as social change. In C. Steyaert, & D. Hjorth, Entrepreneurship as Social Change (pp. 231-250), Cheltenham: Edward Elgar Publishing Limited. Brand, A. (1990). The force of reason: An introduction to Habermas’ theory of communicative action. London: Allen and Unwin. Burke, P. J., & Stets, J. E. (2009). Identity theory. Oxford: Oxford University Press. Cohen, S. (1988). The effective public manager. San Francisco: Jossey-Bass. Down, S., & Warren, L. (2008). Constructing narratives of enterprise: Clichés and entrepreneurial self-identity. International Journal of Entrepreneurial Behaviour & Research, 14(1), 4-23. Erikson, E. H. (1950). Childhood and society. New York: W.W.Norton. Essers, C., Dey, P., Tedmanson, D., & Verduyn, K. (2017). Critical perspectives on entrepreneurship. New York: Routledge. Habermas, J. (1972). Knowledge and human interests (J. J. Shapiro, Trans.). Toronto: Saunders of Toronto. Habermas, J. (1984). The theory of communicative action (Vol. 1). Reason and the Rationalization of Society, (T. McCarthy, Trans. ), Boston: Beacon. Habermas, J. (1987). The theory of communicative action (Vol. 2). Lifeworld and System (T. McCarthy, Trans. ), Boston: Beacon. Hechavarría, D. M. (2016). The impact of culture on national prevalence rates of social and commercial entrepreneurship. International Entrepreneurship and Management Journal, 12(4), 1025-1052. Henricks, M. (2002). Not just a living: The complete guide to creating a business that gives you a life. Cambridge: Perseus . Jenkins, R. (2008). Social identity. New York: Routledge. Jones, C., & Spicer, A. (2009). Unmasking the entrepreneur. London: Edward Elgar. Kalberg, S. (1980). Max weber’s types of rationality: Cornerstones for the analysis of the rationalization processes in history. The American Journal of Sociology, 85(5), 1145-1179. Kelly, D. J., Singer, S., & Herrington, M. (2012). Global entrepreneurship monitor: 2011 global report. Wellesley, MA and London: Global Entrepreneurship Research Association (GERA). Laskovaia, A., Shirokova, G., & Morris, M. H. (2017). National culture, effectuation, and new venture performance: Global evidence from student entrepreneurs. Small Business Economics, 49(3), 687-709. Lewis, E. (1980). Public entrepreneurship: Toward a theory of bureaucratic politocal power. Bloomington: Indiana University Press. Leyden, D. P. (2016). Public-sector entrepreneurship and the creation of a sustainable innovative economy. Small Business Economy, 46, 553-564. Mody, M., Day, J., Sydnor, S., & Jaffe, W. (2015). Examining the motivations for social entrepreneurship using Max Weber’s typology of rationality. International Journal of Contemporary Hospitality Management, 28(6), 1094-1114. Nielsen, S. L., & Gartner, W. B. (2017). Am I a student and/or entrepreneur? Multiple identities in student entrepreneurship. Education and Training, 59(2), 135-154. Orlandi, L. B. (2017). Am I an entrepreneur? Identity struggle in the contemporary women entrepreneurship discourse. Contemporary Economics, 11(4), 487-498. Osborne, D., & Gaebler, T. (1992). Reinventing government: How the entrepreneurial spirit is transforming the public sector. Massachusetts: Addison Wesley Publishing Company. Parker, M. (2002). Against management. Oxford: Polity. Spracklen, K. (2009). The meaning and purpuse of Luisure: Habermas and Leisure at the end of modernity. Hampshire: Palgrave MacMillan. Steyaert, C., & Hjorth, D. (2006). Entrepreneurship as social change. Cheltenham: Edward Elgar. Tajfel, H., & Turner, J. C. (1979). An integrative theory of intergroup conflict. In W. G. Austin, & S. Worchel, The Social Psychology of Intergroup Relations (pp. 33-47), Monterey: CA: Brooks-Cole. Teske, P., & Schneider, M. (1994). The bureaucratic entrepreneur: The case of city managers. Public Administration Review, 54(4), 331-340. Verduijn, K., Dey, P., Tedmanson, D., & Essers, C. (2014). Emancipation an/or oppression? Conceptualizing dimensions of criticality in entrepreneurship studies. International Journal of Enterpreneurial Behavior & Research, 20(2), 98-107. Weidhaas, A. D. (2018). Female business owners hidning in plain sight. International Journal of Gender and Entrepreneurship, 10(1), 2-18.